The Pear is a tender juicy fruit family to the apple. Pears are wider and round at the bottom, getting smaller towards the top. Depending on the variety, Pears can be green, brown, yellow, red or a combination of these colors. Their flavor is lightly sweet and fresh and their texture is soft and slightly grainy. Pears are high in dietary fiber, vitamin C and K, and copper. They are great as a snack, or in desserts and salads. More pears come from the Wenatchee & Yakima valleys in Washington State than anywhere else in the United States. A pear has a tear drop shape. Soft to touch when ripe. Their sizes vary but a good pear is about 3-4 inches in diameter. 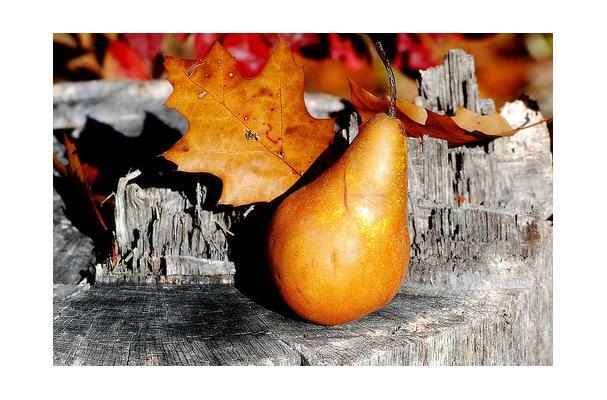 Pears that are not ripe are very hard to touch and pears that are bad have brown spots. Choosing: Look for pears that are slightly soft to touch and that do not have any holes, brown bruise marks or any tears in them. Buying: Pears can be bought at local farmer markets or at your local grocery store. Procuring: Pears grow in relatively mild moist climates. A good rich soil and lots of water help the pear grow. Use this dish as a snack or in a dessert recipe or even to marinade meat. Cleaning: A simple wash under the water facet and a soft towel down will clean a pear. Can be stored for a week in a refrigerator until until brown spots appear. Can also be frozen and saved for later use. History: According to Alphonse de Candolle, there's a very ancient cultivation of the pear tree from the shores of the Caspian to those of the Atlantic.